Have you heard of cloud bread? 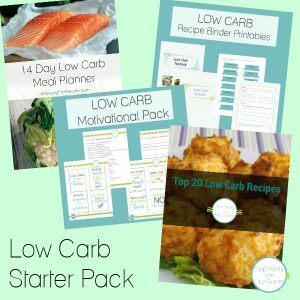 Here’s what you need to know about this low carb, keto, and gluten free alternative to bread – with a video tutorial! I’ve been low carbing for many years and I keep hearing about cloud bread. It’s also called “oopsie bread” (or “oopsie rolls) and it took me a while to realize that they were the same thing. 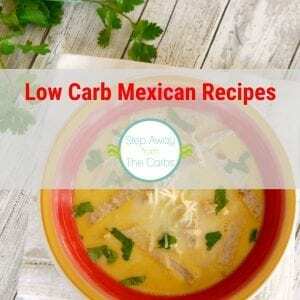 I rely on my low carb tortillas so much that it hadn’t really occurred to me until recently to look for alternatives – but I finally decided to investigate. It turns out that these recipes were all based on Dr Atkins’ Revolution Rolls, dating back to 1972. His recipe involved cottage cheese, eggs and cream of tartar. One low carber known as Cleochatra accidentally invented the “RevolOopsie Rolls” in 2008 – where the cottage cheese was substituted with cream cheese. Subsequently these became known as Oopsie rolls. Her original published recipe included Splenda but she has now updated it on her blog Your Lighter Side stating that the Splenda is not required. Since then she has made all kinds of variations – a huge list of them can be found here. How the Oopsie roll became known as Cloud Bread is still a mystery to me, however. If you happen to know please leave a comment! After a lot of research, the conclusion on this recipe (whatever you like to call it) is that while it doesn’t replace all your bread needs, it is great for some things. 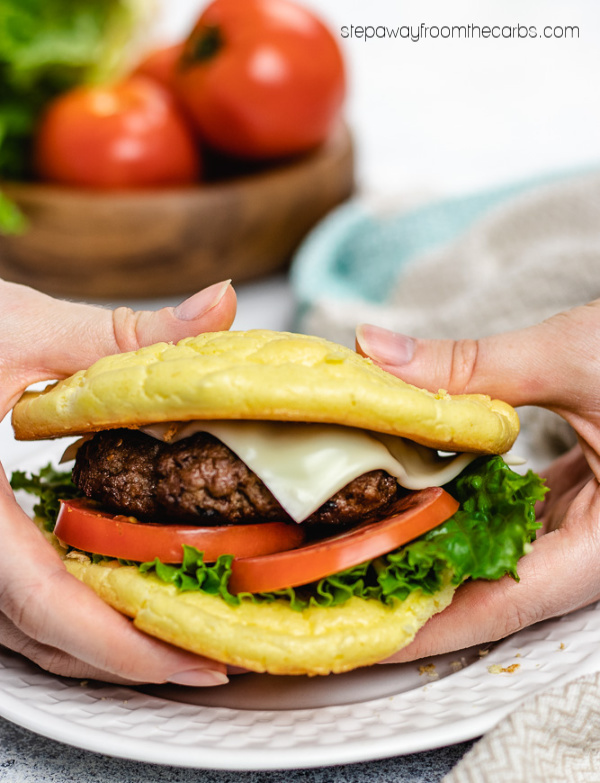 Burger buns are mentioned VERY frequently. First I mixed egg yolks into cream cheese. Then I whisked egg whites and cream of tartar. And then I combined the two mixtures. I spooned the mixture out onto a greased baking sheet into six puddles. I decided to follow the repeated suggestions for using two as burger buns and I have to say the results were very pleasing. Just being able to pick up a burger and munch was quite a treat! I also tried using one as a wrap with cream cheese and bacon, and I also toasted them and topped them with cheesy scrambled eggs! 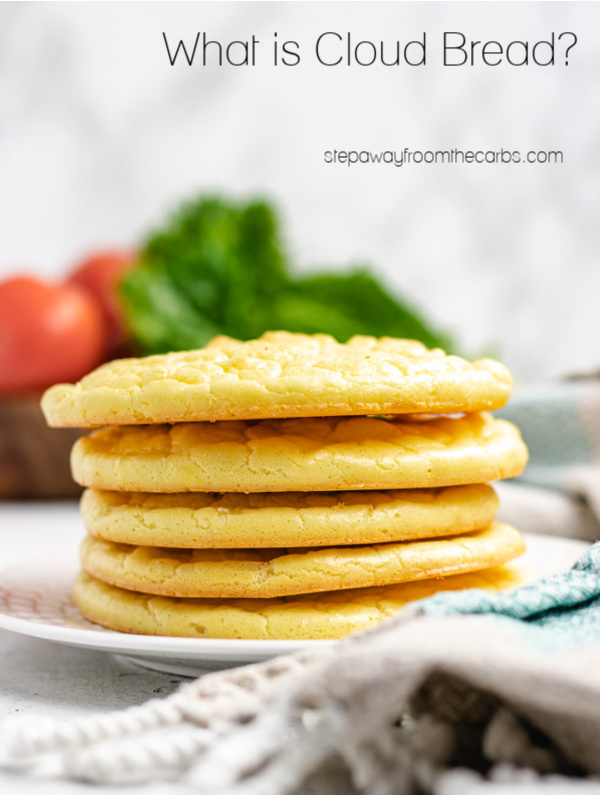 I really like that cloud bread is so versatile – it is definitely worth trying! Oh, and I tried freezing them too – super easy and they didn’t take long to defrost, plus they had a great texture! Have you heard of cloud bread? 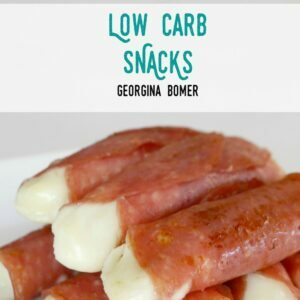 Here's what you need to know about this low carb, keto, and gluten free alternative to bread - with a video tutorial! 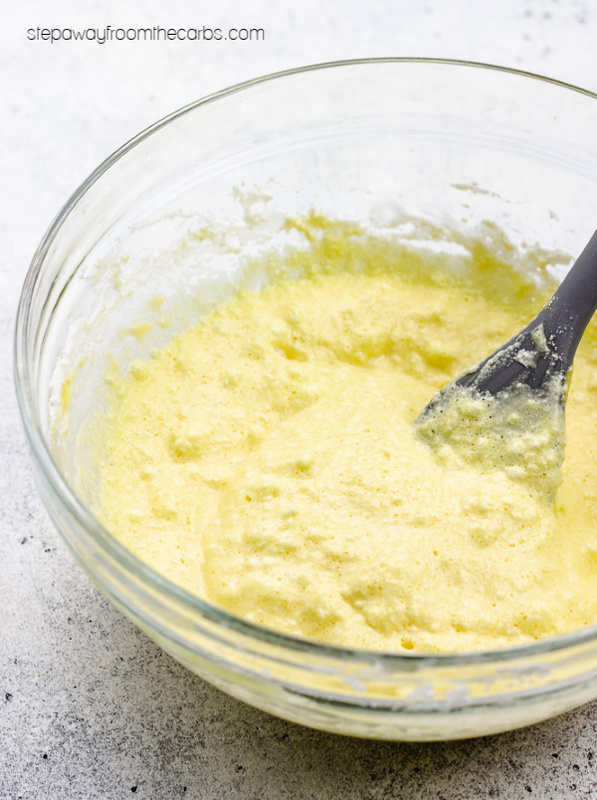 Beat the cream cheese and egg yolks together in a bowl. In a separate bowl, whisk the egg whites and cream of tartar until stiff. 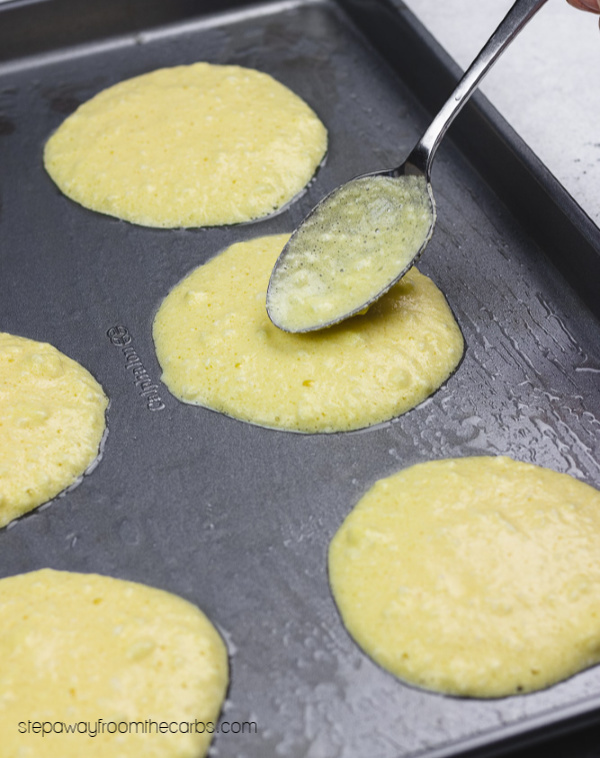 Carefully fold the egg yolk mixture into the white mixture, and spoon onto a greased baking sheet in six puddles. Bake for 30 minutes, then let cool for 5 minutes. Transfer the cloud bread to a wire rack to cool fully. 1g net carb per serving of two pieces (recipe makes six cloud bread "slices"). I’ve never heard of that but I’m totally telling my hubby about that. We need to try this! It is definitely something I’ll be making regularly from now on – the fact that it freezes so well makes it perfect for last minute grilling parties when I don’t want to eat a burger with a knife and fork!! Where’s the recipe? I can never find recipes for anything!! 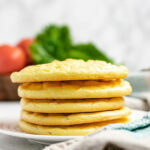 Why is this recipe ( Cloud Bread ) so high in calories ? 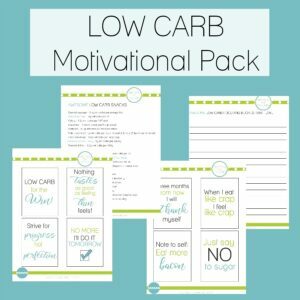 How can the calories be lowered ? It looks so yummy since I am a bread craving woman ! I used to make these years ago on the Atkins plan. Like you said in the beginning we used cottage cheese. I love these and the reason they are called cloud rolls is the way they were light and fluffy. Haven’t made them with cream cheese but I will certainly give it a try. Only “bread” we were allowed back then as low carb bread was not available. Looks and sounds good but how much of everything do you use. Cook them on the stove in a pan and you have a very nice crepe. My husband and I have gone very low carb but bread was really missed by both of us. Tried the cloud bread, it is a good substitute but my husband wanted more ‘bread’ weight. I added 2 tablespoons of potato granuals and it gave it a much denser texture. 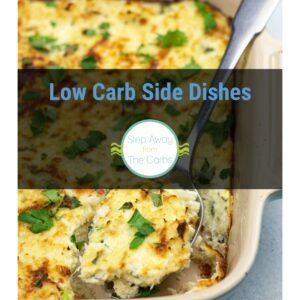 It added about one carb per slice. Now we can have something that can really take the place of the high carb stuff. What a creative idea! I’ve never heard of potato granules! It is instant mashed potatoes. I use Honest Earth. They are granules instead of flakes, all natural and no chemicals. I always have this in my fridge. I use it for sandwiches or smeared with a little peanut butter or cream cheese. It’s really handy, isn’t it?